The Gunpowder River is flowing at 61 CFS and 40F. 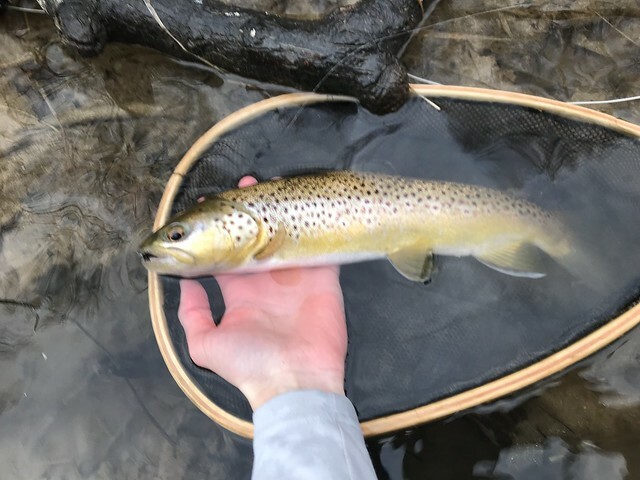 Fishing on the Gunpowder picked up a bit this week as mild air temperatures allowed water temperatures to creep out of the 30s and reach 40F. A few degree bump in water temperatures seemed to bring the river to life a bit more than weeks past. Winter stones could be seen along the riverbank and even a few splashy rises were reported. Drifting small stonefly nymphs and midges is always a good bet this time of year. Streamers will work. In the late afternoon when water temps are at their peak, try an adult stonefly pattern in the faster water. You may be surprised! This entry was posted in fishing report on February 16, 2018 by Theaux Le Gardeur.